Goal: Set up and run VoIP traffic. 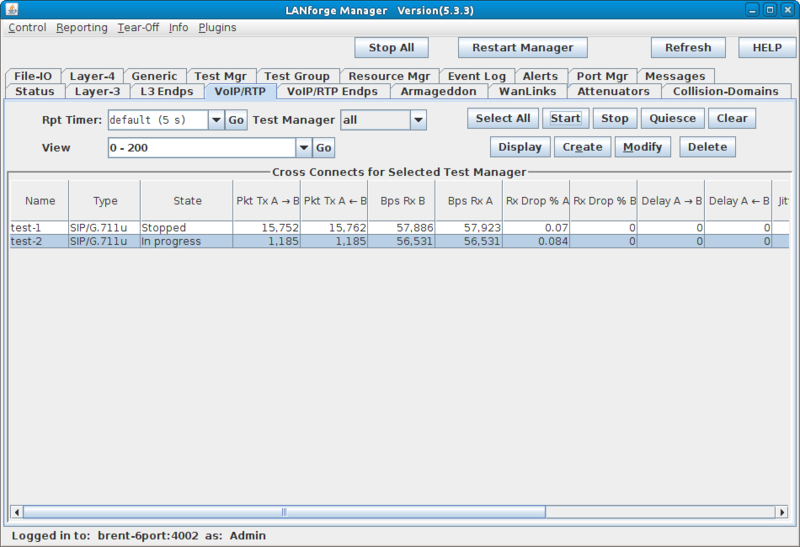 In this example, LANforge-FIRE is used to set up two VoIP test calls that may be used as a basis for VoIP load testing or VoIP Gateway testing. 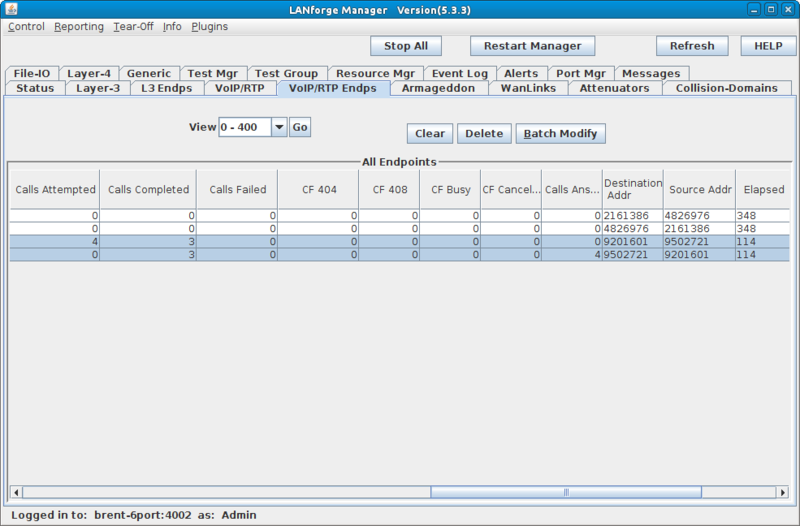 Test 1: Directed VoIP call where a LANforge endpoint calls another LANforge endpoint. Test 2: Gateway VoIP call where two LANforge endpoints register with a VoIP Gateway so that the call from one endpoint to the other goes through the gateway. 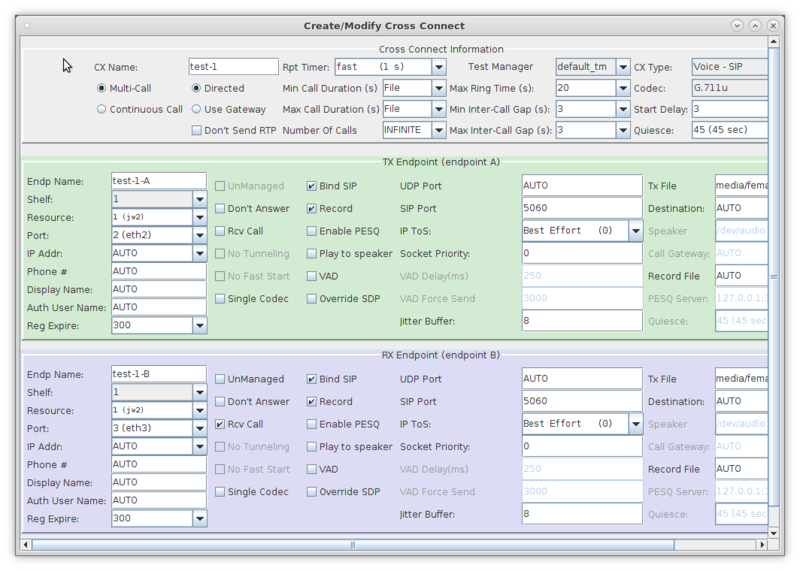 The VoIP Gateway used in this example is Asterisk. Set up the LANforge physical connections. The same two ports are used for both tests. Connect eth1 and eth2 from the LANforge-FIRE system to a network switch that is also connected to the VoIP Gateway. This example assumes that your VoIP Gateway is set up properly. If you need assistance, you can contact us at support@candelatech.com or you can find a basic Asterisk setup at this link: LANforge FAQ: How do I configure Asterisk for SIP Phones? Set up the LANforge ports so that they have valid IP addresses and IP masks. Set up Test 1, a Directed VoIP call. Endpoint A is on port eth2 in this example. If you have a PESQ licensed server available, you can select Record and Enable PESQ. Endpoint B is on port eth3. If you are using PESQ, be sure to enter a Record File and the IP address and port of your PESQ licensed server. Be sure to select the Rcv Call checkbox for this endpoint to receive the call. Set up Test 2, a Gateway VoIP call. Endpoint A is on port eth2 in this example. Be sure to enter the proper username and password for the endpoint so that it can authenticate with the VoIP Gateway if necessary. Endpoint B is on port eth3. Be sure to select the Rcv Call checkbox for this endpoint to receive the call. Run test-1 and test-2 individually.